Every year I plant garlic. Just because I love garlic. Last year I planted 18 cloves of my LFFC CSA garlic. Organic garlic. Red and white versions. If you try and plant grocery store garlic it won’t sprout. It is treated not to sprout. This was a harsh winter. But most of it survived under the snow. Yesterday was harvest day. I got 11 heads of garlic out of the ground. I had three not make it through the winter. And, three that were so puny they became spring garlic. I have no idea where the missing one is. It just wasn’t out there. I got a dozen scapes earlier this year which mostly became pesto. Out of the eleven harvested, three had issues. You can’t dry bruised garlic, so these were roasted today. Probably will be used in a pasta dish the next few days. 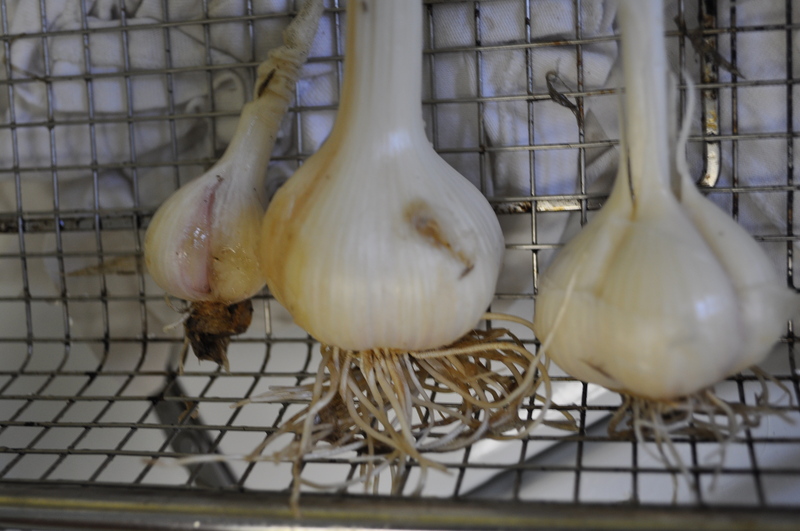 As for the eight good heads of garlic, they are hanging in the dark cool powder room off the mud room. My new hanging method. Skirt hangers. It keeps them separate so they can dry evenly. 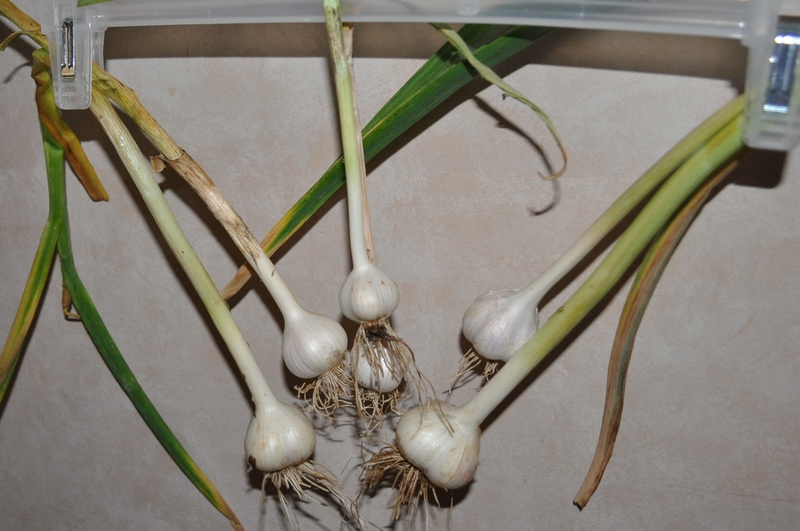 If you get excess garlic this year in your CSA, you can plant some in the fall. Just cover it heavily if you expect sub-freezing temperatures. I planted in October last year. Garlic needs to over winter. Posted in CSA, Food, Gardening, LFFC and tagged CSA, Food, foodie, gardening. Bookmark the permalink. Love garlic and seeing them grow in the garden. An easy plant to grow. I use the seeds from the scapes.